August 2015 was yet another month in which home sales in the jurisdiction of the London and St. Thomas Association of REALTORS® were the best they've been since 2007's Global Financial Meltdown. A total of 864 homes sold in August 2015, up 9.2% overall from August 2014. "2015 is shaping up to be a really good year," says Carl Vandergoot. "So far we're up a solid 9.4% from 2014." Listings were up a very marginal 0.2% for detached homes and down 6.3% for condos last month. Active listings end of period - inventory - were also down, 3.3%. "Over the last few months we've started to see some tightening up of supply," says Vandergoot. "It's too early to suggest that we're going into a Sellers market, but, with supply shrinking, it's definitely a good time to list." August was also a banner month for London's Sister City of St. Thomas, which, with 81 sales, also had its best August since 2007. The average price of a home in St. Thomas Year-to-Date stands at $218,733, up 9.4%. The best-selling house style in LSTAR's jurisdiction for August 2015 was the two-storey, then the bungalow, followed by ranches, then townhouse condominiums, then high rise apartment condos. As of August 31, the average price for a detached home Year-to-Date stood at $282,560, up 4.4%, while the average price for a condo over the same period stood at $191,624, up 4.8%. Year-to-Date the average price of all homes sold through LSTAR's MLS® stood at $264,980, up 4.3%. 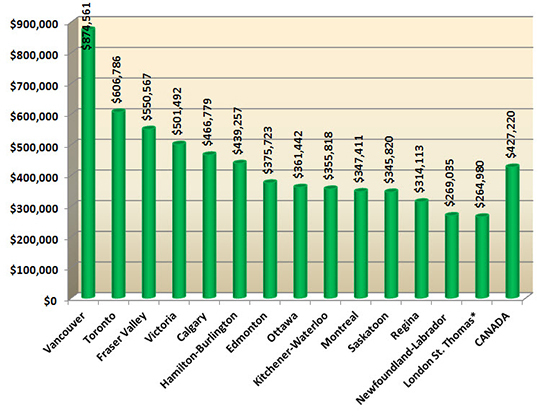 The following chart, based on data taken from CREA's National MLS® Report for July 2015 (the latest information available), demonstrates how homes in LSTAR's jurisdiction continue to maintain their affordability compared to other major Ontario and Canadian centers. According to recent research conducted by the Altus Group, one job is created for every three real estate transactions and approximately $52,000 in ancillary spending is generated every time a house changes hands in Ontario. "That means that this month's home sales injected approximately $44,928,000 into our local economy and created approximately 2,592 jobs," says Vandergoot. "A good month for real estate is a good month for our market as a whole."